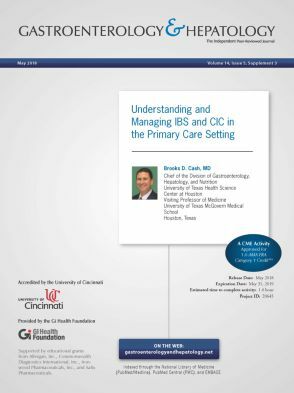 This activity has been designed to meet the educational needs of primary care providers, physician assistants, and nurse practitioners involved in the care of patients with irritable bowel syndrome (IBS) and chronic idiopathic constipation (CIC). This activity has been planned and implemented in accordance with the accreditation requirements andpolicies of the Accreditation Council for Continuing Medical Education through the joint providership of the University of Cincinnati and the Gi Health Foundation. The University of Cincinnati is accredited by the ACCME to provide continuing medical education for physicians. The University of Cincinnati designates this activity for a maximum of 1.0 AMA PRA Category 1 Credit™. Physicians should claim only the credit commensurate with the extent of their participation in the activity. All additional planning committee members, Gi Health Foundation staff, and the University of Cincinnati staff have no relationships to disclose. This supplement is supported by Supported by educational grants from Allergan, Inc., Commonwealth Diagnostics International, Inc., Ironwood Pharmaceuticals, Inc., and Salix Pharmaceuticalsan educational grant from Pfizer, Inc.